Did you have marbles when you were a child? I did. 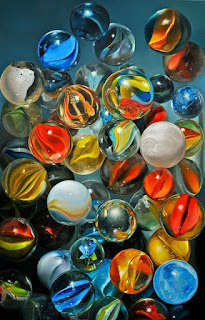 Even as a little girl, I was always very visually oriented, and I loved the glass marbles with variations of color and design. I remember flicking them around a bit but not really playing games with them as much. I collected them in a jar and just enjoyed how pretty they were. If you played with marbles, what types of games did you play? (A nice link with some info on old fashioned marble games here: LandofMarbles.) I'd love to hear from you in the comments, below. Oh my goodness, I LOVED my marbles!! This brings great memories! Glad it brought fun memories for you too! Thanks for the visit.